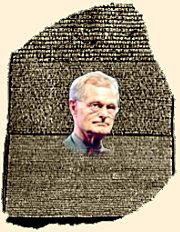 We’re not closing the Rosetta Stone on Bill Warner’s talk just yet: I just got word that we will eventually receive Arabic and Russian translations of the transcript. The new translations may take a while, since this is a long transcript and all of our translators are volunteers. So stay tuned. Also, as requested by Michael Laudahn, a complete list of subtitled versions as of October 16, 2012 has been included with all the posts in “Rosetta Stone for Bill Warner” series.